BEND, OR -- A number of schools in Bend will see some level of construction, this summer. Bend-La Pine Schools Executive Director of Facilities Mike Tiller says a major remodeling project at Pilot Butte Middle School is now underway, "We’re doing a full interior renovation, which starts at the floor: new flooring, new cabinetry, new painting, ceiling, lights – LED lighting – technology upgrades. It’s going to be a very modern school on the inside, once we’re complete with that." It’s also getting a security upgrade, with a shifting of the front entrance, "We’re doing that at several locations, this year. Sky View and Lava Ridge are also getting new secure entrances. And, it does create that visibility so staff can see who’s coming and create a safe environment for the kids." 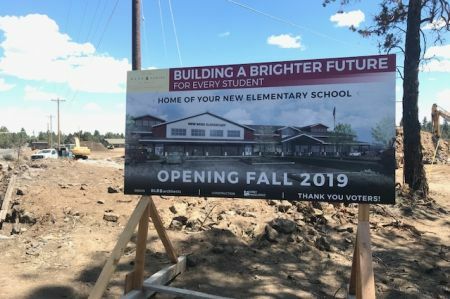 Tiller tells KBND News the Pilot Butte MS project won’t be done at once, so as not to disrupt class time, "There’s a lot of work that’s going to be happening over the next four summers." The work is paid for by a school bond approved by voters in 2017, "We had over 150 projects in that bond measure; two of those were the signature projects to meet capacity needs, which was the new high school and the new elementary." Construction of that new elementary school has begun (pictured). Bend-La Pine Schools Project Manager Gina Franzosa says concrete footings are in place at the site at Cooley and O.B. Riley Roads, "You can kind of tell where the building’s going to go because the building pad has been leveled out. We have to build a new small local road, as part of the development, so you can kind of see that. Drivers in the area will notice some traffic changes, but it’s really moving right along. It’s going to start looking like a building real soon." The school has yet to be named; it's expected to open in the fall of 2019. Construction of the new high school will follow. Marshall High is also getting a new gym and two new classrooms this summer, among other summer projects undertaken by Bend-La Pine Schools.